Host anything from business meetings and cheer competitions to trade shows, concerts and religious gatherings. Each event receives the same professional quality service for which the Merrell Center is known. My experience with the Merrell Center staff has been awesome over the past four years. The facility is very accommodating and customer friendly. The staff is very attentive and understanding of the needs I have had in promoting my first event through what will now be my fifth season. The University of Houston-Victoria has held its fall commencement ceremony at the Merrell Center for several years. The Merrell Center staff’s work behind the scenes helps commencement go smoothly every year, and I appreciate all they do in the planning, set-up and staging of this important event. 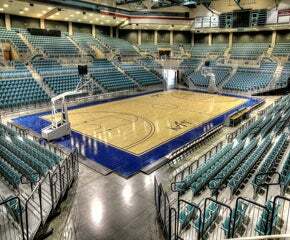 The Merrell Center has proved to be an outstanding venue for the Southland Conference Men’s and Women’s Basketball Tournament over the last five years. The quality of the arena is top-notch, it has numerous amenities for its visitors, and the level of service provided by the staff is remarkable.